We started seriously riding from Kawakamiya in Nakatusugawa around 10:30 am. 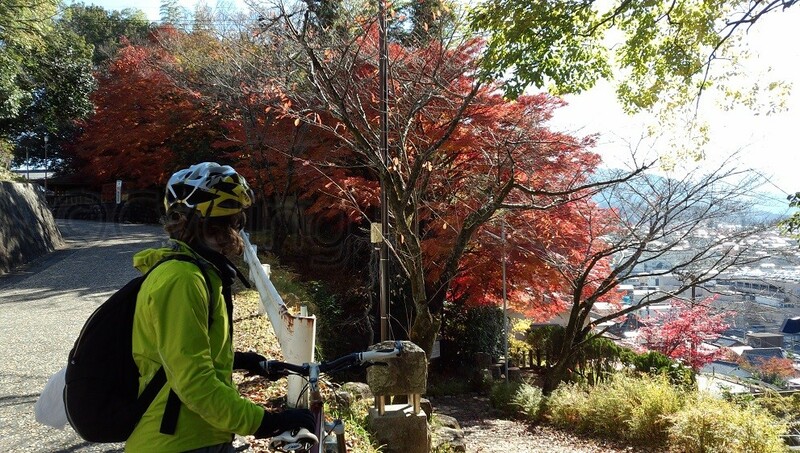 Our first target was Magome post town, which we hoped to reach for lunch and then go sightseeing. We crossed the bridge from where we could see beautiful Mt. Ena and, shortly after we left the block of traditional buildings, entered the modern, rebuilt shopping street of Nakatsugawa. Like other towns that have grown over the past 100 years, the built environment has influenced not just the physical character of places but also their cultural development. In particular, train stations and motorway interchanges led people to rebuild and redevelop without conserving buildings of historical value. It was considered good to scrap the old and build new things until recent years. About 900 m from Kawakamiya we reached the eastern extremity of the post town followed by another masugata with kousatsuba, which is an ancient official bulletin board to inform travelers of wanted criminals, rules and restrictions as legislated by the feudal government and local magistrate. The route begins to incline as it crosses a two-lane road and climbs up sharply towards Nakatsu Junior High School. Modern sections of the asphalted Nakasendo zigzag but we saw the stone paved original route, which climbs almost straight up in the form of stairs. This uphill section doesn’t last long but climbs 30m vertically over 300m. Warming up with such a tough section of the route meant we became out of breath quickly and I had to get off my folding bike due to the lack of gears available on it. Thankfully we could cool down for a bit after our body-powered turbo boost after that by gliding smoothly down a slope for 500 m until we hit the National Route 19, which has become known as “Nakasendo” in the recent motorized era. To avoid confusion I will refer to the motorway as Route 19. After taking an underground passage that crosses under the wide and busy traffic on Route 19 we made a sharp left turn and traveled downwards as Nakasendo swept down a small valley. Nakasendo crosses two small rivers here followed by a series of steep up and down sections. 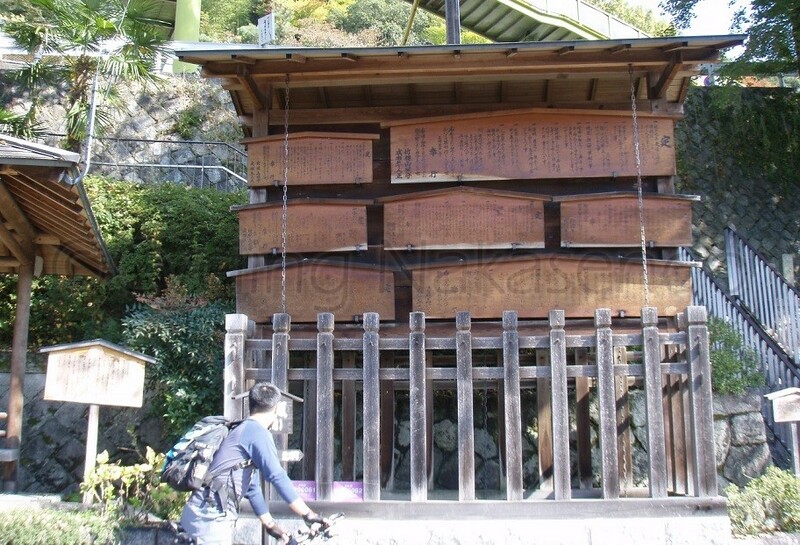 The first section had an elevation gain of approximately 32m for 390m in distance, before reaching Ontake Shrine at the top of a hill through a row of cedar trees. The first descent was even steeper than the uphill sections, dropping 16m over 142m but we were unable to ride down fast because the road is narrow and curves quite a lot. Also it is pretty built up with houses, which while actually making the atmosphere of the route even nicer, meant we had to pedal up from the bottom again instead of being able to use the gravitational energy to accelerate us up the next hill. The next incline starts right after crossing another river. This one was much harder than the last one, climbing almost 60 m over 500 m. With a maximum gradient of an incredible 24.4% it was the steepest of the day. It may be even the steepest on Kisoji! It was obvious at a single glance that it would be impossible on my foldy. Even pushing the bike was hard on this slope. I probably could have ridden even the hardest part if I was on a mountain bike but I would definitely have struggled holding down the front wheel. When I rode this section of the route on my mountain bike I found the slope was so steep that the front wheel kept trying to lift up in the air every time I pushed down the pedal. We took a rest at the end of the slope where beautiful maple trees adorned with autumn leaves and a former teahouse building stood. The teahouse was perfectly located for ‘human-powered’ travelers. Like travelers in the past, we got very hot during the climb so we took off our warm mid-layer clothing and kept on our wind-breakers for the coming downhill sections of the road. From the top we saw Mt. Ena on our right hand side and the mountain ridges we were going to cross in front of us against the clear sky. The downhill section from there was also really steep so we could not fully focus on the magnificent view, but our effort over the climb was paid off with a sheer 42m downward slope that extended over 450m. At the end of the incline we hit Route 19 again, which cut across the Nakasendo. At this point a sign indicated we had to take an underpass to get to the remaining 450 m of Nakasendo. because Route 19 has been built over this section of Nakasendo. 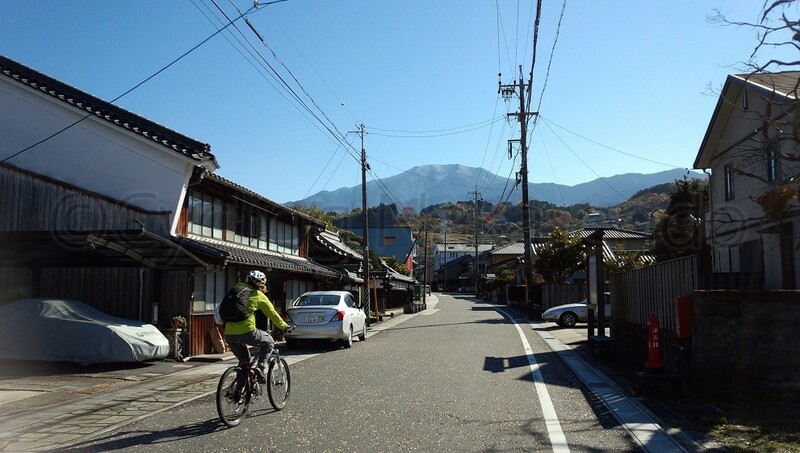 Continuing to follow the direction of Nakasendo, we rode back to the southern side by overpass and approached the post town of Ochiai. The road enters a T-intersection leading to a corner with an old stone sign. A new sign that indicates Nakasendo continues to the right. This is presumably evidence of a masugata, this time on the Kyoto-side of Ochiai post town. Zenshoji Temple’s 450 year old pine tree, also overhangs the street, complete with a sign to alert drivers so that they do not hit it. Ochiai was the last post town in the former province of Mino. Like other post towns, only the gate of its honjin still exists. This is in part due to big fires in the 18th century but, in addition, buildings that had significant status in the feudal era have been demolished. The honjin was an inn officially designated as lodgings for high-ranking members of the ruling class such as daimyos and the family of Tokugawa shogunate. However, the remaining old buildings still in service create a very cozy atmosphere. It would have been even nicer if there was still a water channel in the middle of the street as there had been in the past. I saw a craft shop housed in an old style machiya (Japanese townhouse), which also appeared to be a café. It was tempting to drop in, but we kept riding because we had traveled only 5 km from Nakatsugawa so far and we were going at a good pace so it made sense to continue propelling ourselves forward rather than lose our momentum.The main street of Ochiai lasts for 300 m then proceeds to a masugata on the Edo side of the town. The old stone lantern that stands at the corner of this masugata was made in 1800. While it now stands at the side of the street, originally it was placed in its center to light the post town all night long. Travelers in the Edo period arriving at night must have been so relieved when they saw these lanterns lit on either side (Edo and Kyoto) of post towns. The old Nakasendo passes over Prefectural Road 7 and crosses the bridge on Ochiai River. 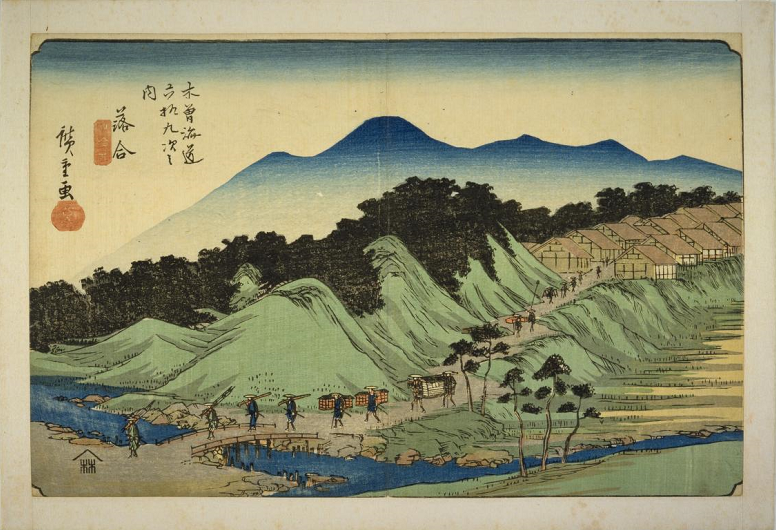 I wondered if Hiroshige depicted this area in his woodblock print design ‘Ochiai’ in the Ukiyoe series The Sixty-nine Stations of the Kisokaido. Behind Ochiai River, the uphill stretch of Tsuzuraore Touge (Tsuzuraore mountain pass), which literally means pass with many corners, was waiting for us. The least steep route we can go on today was replaced in 1771 due to consecutive natural disasters. Although it may be less steep than before, I still had to get off my foldy at some points and walk. 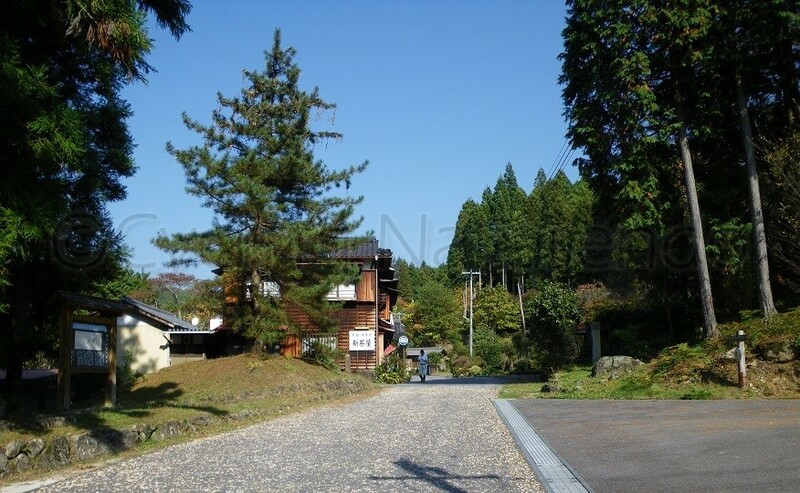 The ascent of Tsuzuraore Touge is 74m over 570m, with the steepest incline being 18.8% in the section of the road leading up to Iouji Temple, which is dedicated to Yakushi Nyorai, a medicinal deity. Iouji Temple used to sell ointment for wounds and was also famous for its weeping cherry. I guess it functioned not only as an emergency rescue facility, but also as a surveillance point for the people traveling on Nakasendo. 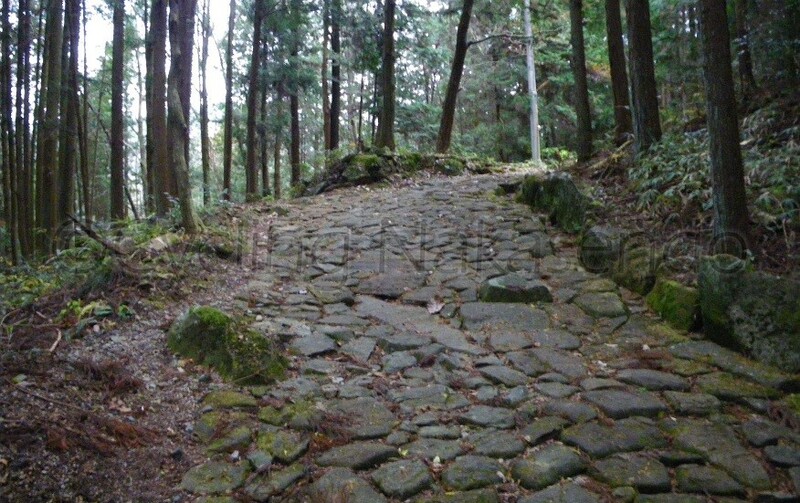 Thankfully the route leveled off from Iouji, after which it passed through a tiny settlement, eventually reaching Ochiai-no-ishidatami (stone pavement of Ochiai). This stone paved road is about 1 km in length, includes some original sections of paving which leads up to the end of Tsuzuraore Touge, and dates back to the Edo period (1603-1868). It is prohibited to ride bikes on Ochiai-no-ishidatami so we would have to push our bikes if we wished to go through. It has preserved the real atmosphere of what it would have been like to journey in the deep forest of the past. However, as travelling over them meant pushing our bikes uphill on a bumpy stone pavement that includes stairs in places, the obvious choice was for us to take a detour. Instead of climbing straight up through the woods, we followed the road as it continued left of Ochiai-no-ishidatami to traverse the valley. I presume this road was built to modify the Nakasendo for wheeled carriages after the Edo period. There we came across beautiful scenery including an autumn gingko tree, terraced rice fields, clear running water flowing in open waterways, Japanese farm houses and distant valleys and mountains. The path merges with a recently-built, wide, two-lane road where sightseeing coaches and tourists’ cars frequently drive along. From there the path extends uphill again. This road is usually busy with traffic and lasts for 870 m and climbs 61 m. As we passed several hairpin curves, we finally found a vending machine in the middle of nowhere. It was just what we’d been looking for since we finished our supplies. We bought bottles of drinks to hydrate us immediately and for the further steep sections of the ride. While we were having a rest at the vending machine, groups of cyclists who were all on road bikes, were looking curiously at our bikes when they passed. We were also over-taken by road bikers after we resumed riding up the hill, but none of them turned right at the intersection where we got back onto Nakasendo. 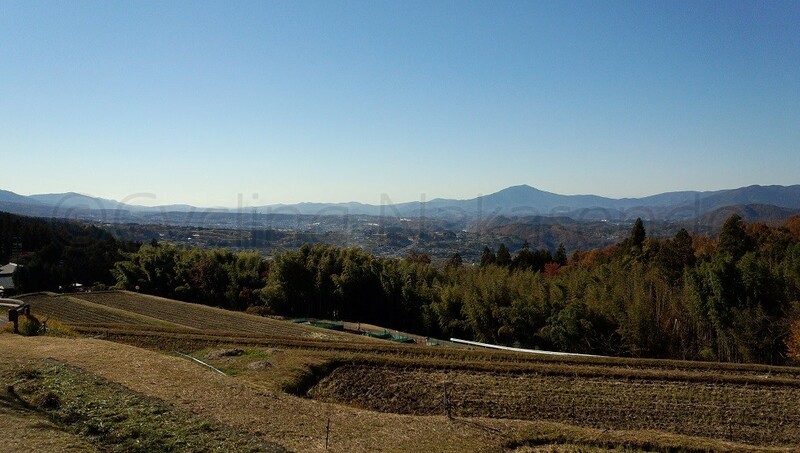 We rode to the top end of Ochiai-no-ishidatami, the border of the former provinces of Mino and Shinano, and reached two perfectly preserved ichirizuka (mile-mounds). Mile-mounds such as these were constructed approximately 4 km apart along highways during the Edo period. These functioned to mark distance and were also used by couriers to estimate how much they would charge for transporting people and luggage. Typically a tree was planted on the mile-mound, many of which still remain today. A pine tree and Japanese hackberry were planted on the mile-mound at Ochiai-no-ishidatami, indicating there was 326 km to Edo. A minshuku (guest house) called Shin-chaya (new teahouse) stood close to the ichirizuka. As the minshuku’s name indicates, it was formerly a teahouse but then was moved to its current location in the late Edo period. It was famous for its warabimochi (bracken starch cake) and still runs as a minshuku today. Kisoji technically starts at this point as indicated by a stone monument that states “Kisoji starts here and travels north”. At this point the gradient became lower compared to the last 1.3 km stretch. The lack of traffic and the gentle incline to Magome meant we even had enough energy to enjoy the peaceful view around us without exhaust pollution and the noise of internal combustion engines. The open view behind us was simply magnificent and also the contrast of old-style housing and tranquil nature would probably be very much what it looked like in the past. We passed a bus stop with name of the district, Kajimachi. This name indicates the area used to be a district of blacksmiths. As we sped down through a small settlement following the ruin of Magome Castle we got our last view of the uphill stretch we had to ride on to reach Magome-juku (post town). Simultaneously we saw a closer and larger view of Mt. Ena on our right hand side. 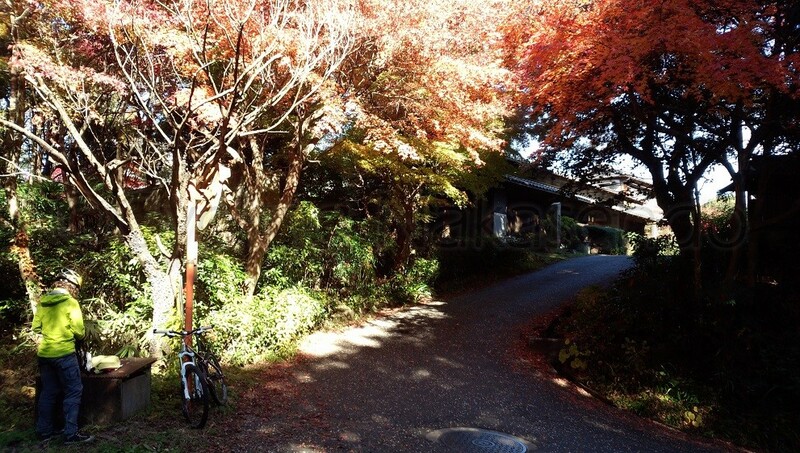 The entrance of Magome-juku was just behind a road, which cut through stone walls built on the top of the slope.